- The approach has dual-hatted positions, with individuals in two programmatic engineering and safety roles also performing oversight of those areas. As the image below shows, this presents an environment of competing interests. 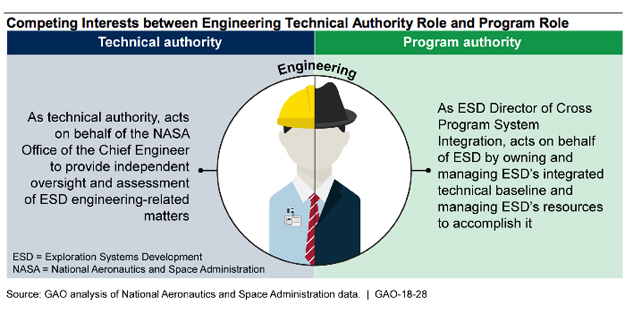 NASA has lowered its overall cross-program risk posture over the past 2 years, but risk areas—related to software development and verification and validation, which are critical to ensuring the integrated body works as expected—remain. For example, delays and content deferral in Orion and SLS software development continue to affect ground systems software development and could delay launch readiness. GAO will continue to monitor these risks. NASA is undertaking a trio of closely related programs to continue human space exploration beyond low-Earth orbit. All three programs (SLS, Orion, and EGS) are working toward a launch readiness date of no earlier than October 2019 for the first test flight. Each program is a complex technical and programmatic endeavor. Because all three programs must work together for launch, NASA must integrate the hardware and software from the separate programs into a working system capable of meeting its goals for deep space exploration. View GAO-18-28. For more information, contact Cristina Chaplain at (202) 512-4841 or chaplainc@gao.gov.